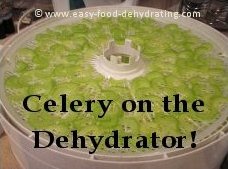 Deciding how many vegetables it will take to fill four full trays depends on what size dehydrator you have, so we created this guide. It does help to have a rough idea as to how many vegetables to purchase at the store! The reason why I picked how many vegetables does it take to fill four full trays is this: FOUR trays is the Nesco dehydrator brand's recommended minimum tray usage. If you use any less than four full trays, for instance, only two trays, then you are not getting the proper air circulation necessary to dry your vegetables properly.